Medical schools are using VR as it's more ethical. Oh, cats. Anyone who has tried to understand one has found that a feline’s fickle moods are simply impossible to predict. But ever wonder what makes cats tick — you know, on the inside? Now you can find out thanks to a (very literally) hands-on new demo in virtual reality. And what better way to demonstrate these new software capabilities than by exploring a cat’s biology? Leap Motion shows off the tech improvements to Orion in a trio of new demos: Cat Explorer, Particles, and Paint. 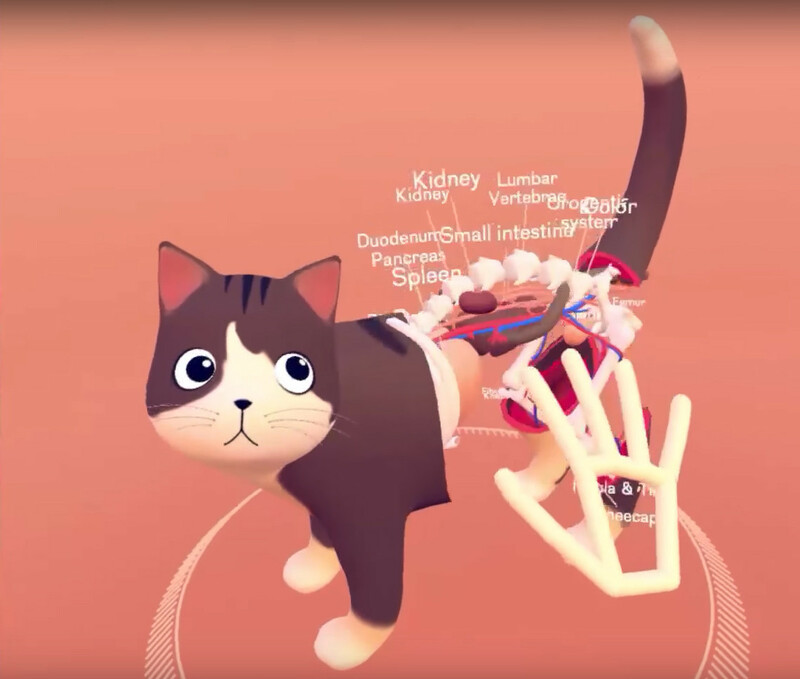 Cat Explorer lets you inspect the interior of a disturbingly forlorn-looking feline in VR. You can run your fingers over its exposed ribs, remove the animal’s skin to look at its muscle structure, or even deconstruct the kitty, poking and prodding each individual bone and organ. In the Particles demo, you can play around with tiny spheres, adjusting their reactions to one another to explore different concepts in physics. The Paint demo is pretty much what you’d expect — it lets you use your hands to create a three-dimensional composition. Just don’t get too upset if your creation looks more like something that would come from Microsoft Paint than the colorful, well-rendered animals and plants featured in the demo video. We’re already seeing medical schools around the world make the transition to VR, since it’s a lot less messy (and, arguably, more ethical) to dissect a virtual human or animal than a real one. Improvements to a system like Orion could facilitate this shift. Meanwhile, Particles and Paint demonstrate VR’s potential uses in physics and art, respectively. It’s not hard to imagine physicists using a more robust version of Particles to test out new theories on the behavior of matter (one of its preset settings is “String Theory”); automobile manufactures already use augmented reality to design their vehicles — some version of Paint could facilitate that kind of work, too. We can’t promise that using the Cat Explorer software will help you understand why your cat chooses to bolt from one side of your house to the other at 3 AM. But, hey, some things are best left mysterious. What does virtual reality mean for the healthcare industry?